We have had some blokes making a funny video clip off a mobile phone, spoofing the National Day Parade and then got the clip circulated on the internet. That was like 3 months ago and it has finally surfaced to front of TodayOnline on 8 Sep 2006 . For some strange reason, there was a big hoo-hah about it and to add more ajinomoto to the pot was the identification of some of our Young Lions (national footballers) in the cast. With that, a witch-hunt ensued as MINDEF would "take action" against the person who filmed and posted the clip online. What action is there to take? 有那么严重吗? I personally thought it was creative and funny. So what was the crime that warrant such a big reaction to want to persecute people? I don't see an malicious intent to desecrate the SAF uniform. Then again, with the lousy resolution of the video clip, can any really say for sure that it is the SAF uniform? Harlow, a lot of other armies also got camouflaged fatique one hor. We merely ASSUME that it is SAF. Can anyone proved that it was indeed the SAF No.4 fatigue? Please lah. Chin chai go Beach Road also can buy the camouflage kit cheap cheap. What about those youngsters who wear the No.4 slacks on the streets of Orchard Road as part of the Hip Hop/Grunge fashion? Want to arrest them and "take action" against them or not? The only undeniable fact was that the "Majulah Singapura" was played. So? Like that also consider desecrating the national anthem har? Please lah. If our boys were to play the Star Spangled Banner instead of the Majulah Singapura hor, I think I lagi more worry. Here's what I think is the bladdy problem. It's not the boys who spoofed the NDP, it's not the person wearing the camouflage fatigue, it's not the person who inserted the national anthem into the clip and it's most certainly not the person who filmed and then circulated it on the internet. Instead, it's these self-righteous people who are raising all these trivia alarms. Suddenly, these people act like they ARE the law. They TELL you what is right and what is wrong in accordance to what they THINK is right and what is wrong. They are of the mentality that they are "more Singaporean" than us. They think their Pink IC on top got paste Gold Star one. They seemed to think that Singapore has a two-tier citizenship where they think of themselves as First Class citizens while the rest of us in the lower tier. Unfortunately, there seemed to be more and more of these people infesting the gahmen offices as well as the various civil service. For some strange reasons, whenever this topic comes up, the first thing that comes to mind are almost always the gahmen scholars. I wonder why? 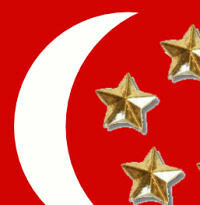 As for the rest of the people with the gold stars on the Pink IC, LAN TUI, UNDERSTAND!!!?? You want gold stars har? Come, gimme $2.70 (GST included) and I go Popular Bookstore and buy gold marker to paint the stars for you. Afternote: It also got me thinking about how the Gahmen is lamenting about the lack of creativity amongst the Singaporeans and hence the need to bring in foreign talents to boost inspiration. Seriously, with this type of hypocrisy going on, how do you expect Singaporean creativity to blossom, let alone flourish? Don't understand how spoofing the NDP in a toilet can be a threat to national security. Meepok: Exactly my point. Such heavy handed knee jerked reaction is just indication of how brainless one can be when looking and dealing with a certain issues. The distressing part is that there are a LOT of these brainless people in the boiler room of our Gahmen.